It’s real! It’s happening! Fallout 4 will be miiiiine. Power armour. Brotherhood of Steel, Enclave or a new powered faction? A dog. Yet another descendant of Dogmeat, found in Fallouts 1-3? Hopefully an NPC. Workbench and tools – hammer, wrench and other such crafty workshop items. A disassembled PipBoy. Of course. Mister Handy. You can distinguish him from the military Mister Gutsy by the cylindrical saw. Magazine rack – skills magazines have been used throughout the series to provide temporary skill buffs. Guns. Lots of guns on the back wall. A Vault Boy bobble head doll. Nuka-Cola everywhere! And no sign of the obviously-lesser Sunset Sarsaparilla from New Vegas. All the usual detritus – Abraxo cleaning fluid, Sugar Bombs and other crap with which to fill your inventory. You’re from Vault 111 this time. Eagle-eyed friend of The Average Gamer Dave Jewitt spotted that the location at 1:41 is labelled Scollay Sq, which is in Boston. There’s also the gold dome of the Massachusetts State House, an iconic landmark of the city. 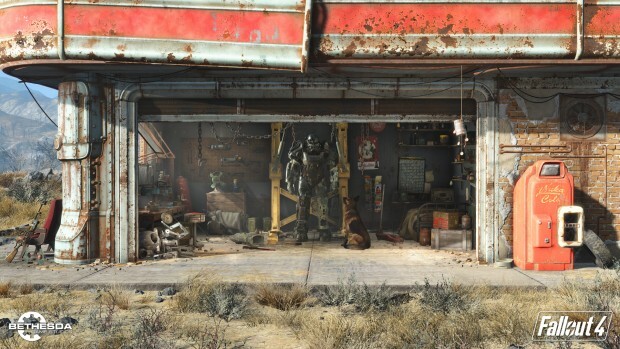 You’ll see a Protectron security robot, helicopters, a zeppelin, another bloody deathclaw and much more that’s familiar to the Bethesda Fallout world. More details will be revealed at Bethesda’s E3 2015 press conference on 14th June. It’ll probably be streamed on their Twitch channel. Next Story → Wander. Get Lost.